Bought slightly used with 1,800 miles on it. Tiny but OK once I get in it. 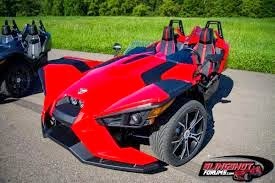 This all started at the Motorcycle show with the new Polaris Slingshot- a 3 wheel vehicle registered as a motorcycle but with side by side seating, steering wheel and a Chevrolet 4 banger 2.4 L, 173 horsepower engine in it. Since it was priced at $24k I thought what else is out there that could work as a replacement for the motorcycle when I just don't want to ride and the Miata popped up. A new chapter in the life of my blog is underway and this is the next step. I have been taking banjo lessons for a while now and a symptom known as SBAS or Sudden Banjo Acquisition Syndrome has hit me hard. As usual I am always looking on Craigslist or E-bay and lately I found a new forum dedicated to the world of banjo players as well as other stringed instruments called Banjo Hangout (naturally) and have been reading all the discussions regarding a wide variety of topics relating to the banjo experience. On this forum I posed a question regarding whether a better banjo would help make a better banjo player and while there were some plain YES answers there were also some qualified possibly yes answers. Meaning that yes, playing a new better banjo than my starter model could help motivate me to practicing more as well as creating more interest and positive feedback. Some also stated that there is no need to upgrade until I was more accomplished...hey what do they know. As a result of that interesting and mostly positive feedback plus some careful searching I happened to take a look at Amazon.com since they do list and sell Deering and other banjos. I pretty much decided on Deering since it is what I have now only in the Goodtime basic banjo called a Classic II 5 string resonator model. Then there it was the deal I could not resist online at Amazon, I could not fight the extra $320 discount on top of the other almost $1,600 discount and my finger just hit the buy it now button. Now my actual playing level does not match the quality of the instrument and who knows when or if it ever will but as my friend Johney says, "you can't take it with you so might as well enjoy it all now". The package included an outer Amazon box with a Deering shipping box inside, holding the case with the banjo in it, all very well protected. Great hard plastic formed sleek looking case, very nice. Curly maple resonator and neck, looks very nice. Barely able to play the banjo but here we are. The Firemen's hat is just a prop for entertainment purposes. I bought that off e-Bay some time ago. Sunday ride to Newcomb's with a bit of adventure. FOR DETAILS drop me a line or post a message on here. The fun part of the ride up to now. We left Newcomb's and ran into a problem on Angeles Forest Rd. Checking for injuries, mostly in the shoulder. I was acting as Tail-gunner and not involved in any accident. June 5, 2013 and two events are occurring in the same place…Durango Colorado, and about the same time, so it must mean it’s time for another trip. 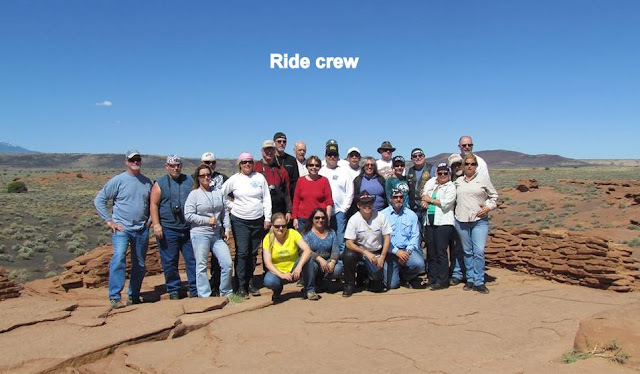 Since 2009 I have been going or attempt at going to Durango for the Beginner Bikers Potato Ranch Rally at the home of Jo the Durango resident that has hosted this event for over 5 years now. This will be my 4th complete trip along with one attempt making it to Flagstaff but turning back in 2011. New this year is a 5 day group ride from Orange County of about 20-23 riders for a first time ever multi day trip to the same place but just one day off from the Rally. This means I am going for sure. As part of preparation for an approximately 1,800 mile 5 day trip, the Road Star gets 2 new tires and valve stems, new rear brakes, oil change and general check up by my friend Johney who does all the maintenance. What we did not replace is the battery and this will come up later in the story. The rest is packing everything I will need including two different jackets, warm clothing and very light cool gear for the expected hot desert travel this trip is famous for. There is only so much room so it has to all fit somewhere. The group of Orange County riders numbers about 19 motorcycles at the start but we add 3 or 4 along the way, I could not keep track. We meet at a gas station off the 91 freeway at 4:30 AM and its dark and chilly out. I was so glad for the departure day to finally arrive even knowing the heat was in front of us. There are two groups and I am in Ed’s group #1 and off we go. By the way, times shown on photos are one hour off due to Daylight Savings, I forgot to adjust it. Our first stop is in Newberry Springs on I-40 about 120 miles from our start past Barstow for gas and a short break. It is starting to warm up. Next stop another 120 miles further is wonderful Needles, CA where it will be hot for sure. Thinking ahead I purchased a subway sandwich the night before so when the group stopped at Denny’s for breakfast I had food ready in the duffel bag no need to buy anything. It’s time to get serious about the heat so on goes the Kool Vest along with drinking extra fluids to maintain hydration through the heat ahead. I think I finally have the hydration and cooling down fairly well since during the entire trip I never experienced real heat trauma, major sunburn or light headedness. Needles, CA to Kingman, AZ is a shorter 60 miles which helps, otherwise it gets very tiring to have three long intervals between stops. Everything is proceeding according to plan and everyone is holding up well including me, except for the rider in front of me who is having some difficulty with the heat. Back at Needles we discussed drinking less water and more Gator-Ade to infuse electrolytes and to keep him alert, which seemed to be helping. The plan was to continue on to Williams, AZ some 114 miles distant. I asked Ed and rider leader Scott if we could stop at Seligman, AZ instead and sure enough they were very accommodating, shortening the next gap to just about 70 miles. We still stopped in Williams, but I felt much better having that extra break on the road, a couple people thanked me for requesting the added stop. It’s only 32 more miles to Flagstaff, AZ our overnight for day one and then we were there. I booked a room at a different motel after misreading the one the group had booked and this would cause a small problem in the morning. I had a great room and stopped in at the motel everyone else was at before turning in, but in the morning could not start the Road Star. Oh No, big problem and no one around to help. Seems the cold overnight temps made the clutch somewhat sticky and the battery could not turn the starter over to free it. After calling Ed who offered helpful suggestions and then AAA which was no help, tried again and slowly it started to crank around. Wow, was I lucky and for the remainder of the day no further problems occurred but this was an indication of possible battery weakening. Making my way to the main motel we decided to buy a battery from a close by O’Reilly Auto parts, and yes they had a Road Star battery so I bought it to have along just in case. The other rider in front of me also needs a jump start as his battery is also having problems but makes it to Durango as well. Leaving Flagstaff we turn off at Sunset Crater Volcano National Park for a sightseeing side trip past the crater and Wupatki and Wukoki Indian Ruins. We are now headed into Indian country and that is for real as we enter the Navajo Indian Reservation stopping at Tuba City on Highway 160 for gas and lunch. Choosing Sonic Burger along with Doug, Cindy, Daveta Jo and others it was a bad decision. Doug and Cindy suggested the place, phoned in an order but never received it, terrible service. No one working there seemed to have any idea which order went where or what it was; Sonic is off my list forever. We leave Tuba City but no more than 6 miles out the same rider in front of me motions some sort of problem and pulls to the side. The rule is we do not stop, but the tail gunners peel off to help assist and determine what is wrong. We hear there is a tire problem. Next stop turns out to be Kayenta, AZ where we will turn left to head through Monument Valley and on to Cortez, CO. The heat does not let up until we get to Cortez, CO.
At Cortez our last gas stop about 50 miles from Durango, we learn that the rider with a tire problem got it towed and should have a repair soon. I do not learn the full story until Durango. Photo below is at the Chevron in Kayenta, Scott one of the tail gunners catches up after helping the other two riders deal with the $300 tire problem. Again in Durango I am booked at a different motel and this time I am happy with the decision. I have a nicer although more expensive room and a fairly level parking area, I like it. I get to the battery and with help from Evan and Brian who carried it in his trailer, we see it is the wrong size, does not fit. Luckily there is an O’Reilly Auto parts store just a few blocks away and I go there. After pulling the battery we determine they do not carry a battery that will fit so I get a refund (Hurray!) and will wait till morning to check with a local Yamaha dealer. It was also helpful to have Johney available via phone to consult on the battery issue and while I was concerned never really felt any sort of panic about the problem, I am surrounded by friends that will help as much as they can. Remember, if you can keep your head about you while all others are losing theirs, maybe you just don’t understand the situation. It is also where I learn that the rider with a tire problem lost the rear air valve stem due to aging of the rubber seal and is not a tire problem. The store in Tuba City that towed him in has a replacement stem so the rider and tail gunner proceed to do most of the tear down work to get at it, they install the stem replace all the parts and he is good to go. For a 6 mile tow, a $3 stem and just a little effort on the employees part the cost is an outrageous whopping $300. Do not get caught in Indian country needing emergency repairs at least not in Tuba City. That will be in cash also. Luckily they got it settled and off the two of them go heading for Durango arriving about 9:15 PM in the evening. Tail Gunner Bob B. really stuck to his duty and helped get them both caught up, really makes you feel good about riding with the group, that’s no joke. The next morning the tire and battery rider and I both head to the local Yamaha dealer where we get his wheel and battery problems along with replacing my battery all sorted out. While everyone else is off touring in the mountains we have been here waiting for service on his Honda and it’s around 1:30 in the afternoon, but still time to ride to Silverton and do some sightseeing. That is just what we do and have a great time along the way, it was more than enough to make the trip worth it. Silverton is less than 50 miles up in the mountains so even with stops at two mountain passes we make it by around 2:30 PM, in time to catch Doug and Daveta Jo just leaving. Returning to base I have time to relax and then head over to the Potato Ranch-Jo’s home just south of Durango. Where did Potato Ranch come from, seems Jo uses Miss Potato-Potatohead sort of the sound a Harley makes, as her on-line forum name therefore the Potato Ranch and headquarters for the Rally. I still don’t remember all the names of attendees, but know the faces-mostly. We all leave the ranch and head into town for dinner at Francisco’s and what do you know the prime rib is on special-it usually is. A fun evening spent with long time online and in-person motorcycle friends where someone my age seems to fit right in with a much younger crowd. What looms ahead is the early morning wake up and two day hot ride back to Orange County and home. I am up early and go to the McDonalds for a bite to eat since I forgot we are going to stop in Cortez for breakfast, still it was a good idea. Two groups with a couple added riders arrive in Cortez at a Denny’s classic Diner and breakfast takes a long time, I barely got my breakfast but sneaked some from Daveta Jo especially the fruit bowl, it hit the spot. We are heading back toward famous Tuba City where we stop in the heat for lunch at McDonalds again, soak the vests, put ice in the drink thermos, fill up all the water bottles and head for the Grand Canyon, I must be carrying 3-4 pounds of water and drinks all total. On the way to the Grand Canyon we take a sightseeing stop at 4 Corners where four states meet, if this is not the exact spot it is not too far off. It has been greatly upgraded since I was here in 2009. I stop at one stall to buy Fry Bread and Daveta Jo gets to see me do a rain dance. The Native ladies laughed their heads off. I have never been to this end of the Grand Canyon so look forward to it and I can use the senior free pass where others have to pay $12 or $25-not sure which. As always the Grand Canyon is truly a wonder of the planet so I took lots of photos. These below are from the second stop at the Visitor Center. The last day, Sunday and record heat is indicated from Kingman to Needles, and Barstow, Oh Joy. By wetting down the Kool Vest, having a bottle of water handy while riding and drinking lots at every stop I am holding up surprisingly well, Gatorade really makes a difference. The group splits up at Kingman and I join in with Chuck, Patti, Doug, Cindy and Bob to take the I-40 and I-15 route while the others go through Lake Havasu to 29 Palms, everyone makes it safely back with maybe an hour difference in time. My body had really absorbed a lot of heat during the ride and using cold towels helped bring it down but it took a while. Equipment and gear report: on a long trip like this things can happen and lucky for me the battery issue never rose to the level of disaster, the motorcycle ran fine, the BrakeAway throttle lock helped keep my hand and arm from getting really tired holding the throttle grip, my new bottle holder mounted on the saddlebag guard provided extra water while riding, and even though I dropped my helmet did no damage to anything. One casualty was my green American Tourister duffel bag; it split at least two seams and no longer usable. 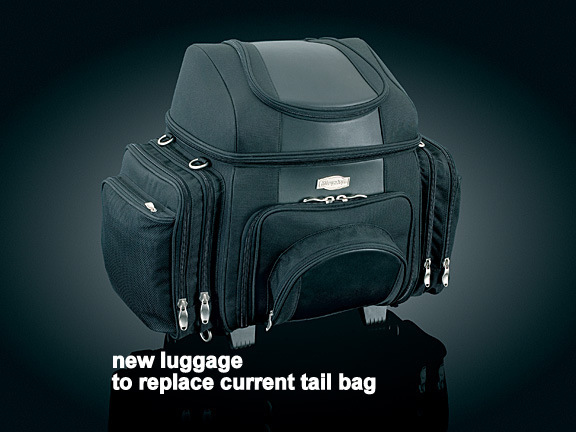 The Tourmaster Tail Bag is also looking rather weather beaten so an upgrade is in order. After looking on line and at duffel bags in a sports store decided to buy a Kuryakyn Grantailgater luggage. It should be more than adequate to handle everything eliminating a need for the duffel bag. It’s large, has multiple pockets along with a pull handle and wheels so I will no longer have to carry all that stuff, just roll it along. The next trip with the group is to Pismo Beach.